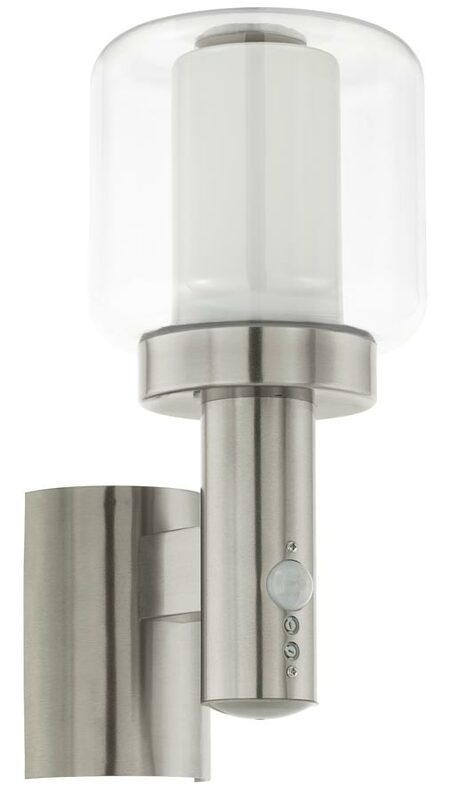 The Poliento stainless steel outdoor PIR wall light with double glass shade is rated IP44, contemporary and stylish. A modern lantern style exterior wall light, with curved profile wall mount, cylindrical stem, white glass inner cylinder shade and clear glass outer. Integral PIR motion sensor features 110° detection angle, 7 m maximum range and 10 sec – 5 min activation time. Practicality meets modern chic to create a practical outdoor sensor activated wall light that will provide many years of service. Compatibible with low energy and LED lamps. There are matching items availble in the Poliento range, please see below. Can this light be switched on permanently during the hours of darkness? This light doesn’t have a manual override facility so is not suitable for being switched on permanently.